Turkey's leaders often boast that their country has a big and quickly growing economy and a big population. That criterion never makes a country a decent place to live in. That explains why most Turkish expats are scattered through Europe's tiny countries instead of Bangladesh or Egypt. And why, of course, Turkey ranks 69th in the UNDP's Human Development Index, behind all of Europe's smaller countries with slowing economies. In Turkey, many of the social maladies are so persistent that we journalists must often revisit archives and, sometimes, must even repeat our headlines or column titles – such as this one, which first appeared in this column in May, when 301 workers in Soma were killed in an explosion, once again proving why Turkey's mines are six times more dangerous than China's. A parliamentary motion submitted by the opposition to set up a committee to investigate the mine in Soma had been rejected by the votes of the ruling Justice and Development Party a few months prior to the accident. Mysteriously, the government's most recent inspection at the Soma mine – at the end of March – had found out that the mine was "successful" in terms of workers' health and safety. President Recep Tayyip Erdoğan, then prime minister, said after the accident that "death was in the nature of mining." He was motivated by defending his party's popularity in the aftermath of the tragedy – and shortly before the presidential election which he comfortably won. He did not need to worry, I wrote here. Presidential elections showed that his popularity in Soma had risen by two percentage points after the accident. 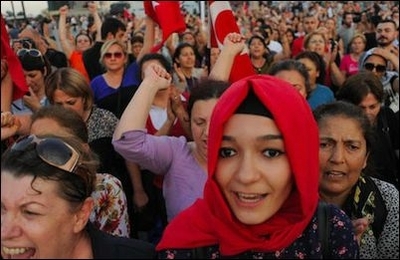 Nearly half the grief-stricken town voted for Mr. Erdoğan on Aug. 10. Apparently, death, in Turkey, is not in the nature of mining alone. On the weekend, 10 workers were killed at a construction site in Istanbul when an elevator carrying them malfunctioned and suddenly plunged to the ground from the 32th floor during an early evening shift. And a similarly bitter story has unfolded. Back in April the same elevator at the same construction site had plunged and killed one worker. He was a mere statistic among the 1,270 workers killed in accidents in the first eight months of 2014 alone. Labor Ministry inspectors arrived at the site for their postmortem checks and found several functional weaknesses and errors with the elevators. Instead of suspending the construction like their colleagues in smaller but better countries are obliged to do, they left the site after giving the operators of the construction, one of Turkey's biggest, a fine worth about $7,000. Two weeks ago, an elevator at the same construction site malfunctioned again and plunged from the 15th floor, only to miraculously stop before reaching ground. The construction had to carry on. It did, and produced 10 new coffins. What will happen now? The rich construction company will pay their families fat compensations. They will be entitled to receive government benefits, too. They will mourn their beloved ones but believe that, as Mr. Erdoğan often stresses, they died because "God wanted it so, not because of human negligence." By next June, their anger will have subsided and they will run to the ballot box to vote for the governing party, hoping the flourishing construction industry will keep on producing more jobs for their remaining relatives. The families of luckier workers who will carry on their shifts will feel grateful to the government because their beloved ones have jobs thanks to the flourishing construction industry and a quickly growing economy. Just as only a few people remember what happened in Soma and why only four months ago, the tragic plunge of the elevator will slowly fade from the newspaper pages and Turks' collective memory. Only until a similar accident kills others and we journalists revisit archives to repeat our headlines and column titles.